My students are looking at how photosynthesis is changing over the course of fall phenology. 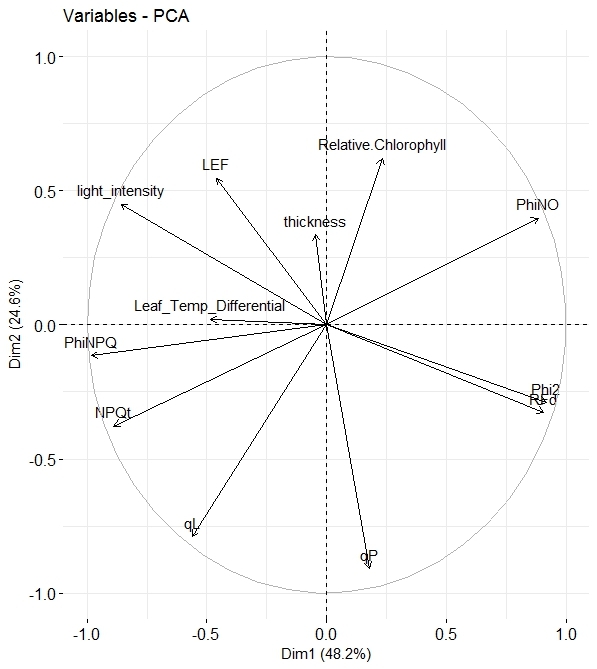 Junker and Ensminger show that phiNO increases as chlorophyll is lost in maple leaves. This sounds reasonable to me based on the relationship between NPQ and pmf. However, my students are getting data from the multispeQ showing that phiNO is lower in yellow leaves. I don't understand why my students are getting this result. Any ideas? I took a quick look at your data and see a decrease in phi2 in yellow leaves, which is expected. There are also absorbance/rel. chlorophyll differences in green vs yellow leaves, also expected. Hello. There is not everything is so simple in the "relationship" between chlorophyll and PhiNO. I think that PhiNO must and most depended with the reaction centres (qL), other pigments than only chlorophylls. SPAD don't the representation all classes of pigments. In my research (exclusively on the field is not in the laboratory), I see the positive correlation between Chlorophyll (SPAD) and PhiNO. In the laboratory research (where the light don't fluctuation) more often I see a negative correlation. Would you please suggest how can I do PCA analysis using Minitab, SPSS, OriginPro etc. Whenever I do, it is only based on one factor. The main objective is to find out which chlorophyll fluorescence attribute is associated with salt tolerance of which wheat variety. It is possible LEF, Phi PSII may contribute in one variety and Phi NPQ, NPQt contribute in other variety. Andriy Herts, Nataliia Herts: In my research (exclusively on the field is not in the laboratory), I see the positive correlation between Chlorophyll (SPAD) and PhiNO. In the laboratory research (where the light don't fluctuation) more often I see a negative correlation.